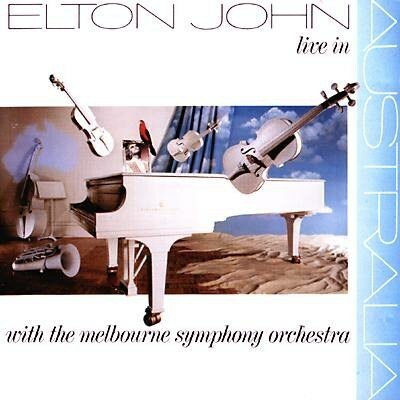 Elton's first live release in over ten years. Not your traditional live release, a compilation of hits, but rather this one was some of the lesser known works accompanied by The Melbourne Symphony Orchestra. The original concert, which was in December of the previous year, featured the traditional Elton live show for the first half, and the second half, featured here, with the above mentioned partnership. Although released as a double album, it was purposely kept under 76 minutes to fit on one compact disc, which more and more consumers were now buying. Most of the selections are from the earlier part of Elton's career. In fact there's nothing here post 1976 and the majority of the material here was originally recorded in or before 1971. Many of these early songs were done almost exactly the same as the early records, implying that one of the real reasons of this recording was to reintroduce these great songs to a new audience. There are a few well known songs, but not enough to call it a "hits" package. Your Song, Don't Let The Sun Go Down On Me, Tiny Dancer and Sorry Seems To Be The Hardest Word are the only songs out of fourteen tracks that most casual fans were probably familiar with at the time. The one single Candle In The Wind was finally released in the States in this live version and gave the song the long overdue attention it so deserved. The release boasts that "no overdubs were added" and for the most part manages to succeed because of this. The one drawback was Elton was suffering from tumorous nodes on his throat and his larynx problem is clearly obvious. As a listener, you have the urge to clear your own throat while the cd is playing. Because of this problem, he went two years between studio albums, but fortunately, the condition was not malignant and his voice would regain most of its strength back.